When did the Roman Catholic Church get so big? Topic: When did the Roman Catholic Church get so big? As we know, the Roman Catholic Church sort of dwarfs most other churches nowadays, but was it always so much bigger than the Orthodox Church? Or did it increase in size after the Great Schism? For example, around the time of the Great Schism, were there as many Christians on the west side as there were in the east? Which side had more bishops? I don't know if there's much historical data on this even but I figured I'd throw the question out there in case someone had a good estimate. Re: When did the Roman Catholic Church get so big? The RCC greatly increased in number post-schism. This is largely due to the colonization efforts of Portugal, Spain, France, England, and other Western European Nations. 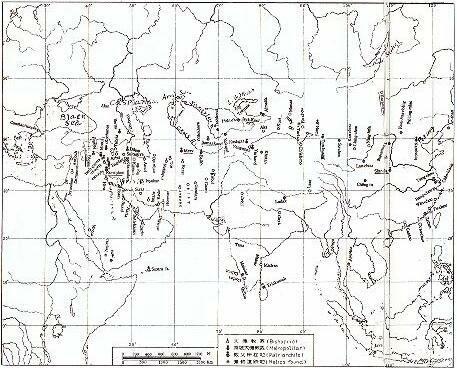 Also, Western Europe did not suffer under the Mongols and the Ottoman empire as Eastern Europe did. As far as Bishops, at the time of the schism (and to present day), the East had the Patriarchates of Constantinople, Alexandria, Jerusalem, and Antioch. (Moscow was added later.) The West simply had Rome. How many ArchBishops and such I am unsure. I've read that at the time of the schism, there were more Christians in the east than in the west. However, I can't remember where I read it so I can't give you a source. I wonder if this includes OOs and the ACOE. I would guess probably so. Why would they be included when they split 6 centuries earlier? Did they cease to be Christian? Somewhere here Fr. Ambrose posted a chart. The Roman Empire and Kievan Rus' alone had a large population. Spain, which is orange, was a third Muslim at the time. Syria had a lot of blue in it. Btw, the population of the world was around/just over 300 million at the time. A good point was brought up last night after Church... The Roman Catholic church didn't really start forcibly converting others until after the Great Schism. This was possibly due to not only being separate from the Church but also having contact with Islam, which spread so rapidly through the use of the sword. In the way that Islam promoted iconoclasm among Christians, I think it's reasonable to say that it also promoted conversion by force. A good point was brought up last night after Church... The Roman Catholic church didn't really start forcibly converting others until after the Great Schism. This is not true. Charlemagne proclaimed the Saxon Wars (772-804) to be religious wars with the express intent to convert the Saxons in Germany from Germanic paganism to Christianity. This is why some persons (Fr. John Romanides, Fr. Andrew Phillips) consider that the actual schism has its roots in Charlemagne. On one hand, yes this would have been outside the Church and your point stands, at the same time, this was before 1054 and we were technically still in communion. True, though I'm sure we could also find some instances of the Byzantine Empire doing similar things. My point wasn't really about minor religious wars, but rather about mass genocide/inquisitions and forced conversions. The way and scale at which Islam was spread by force was unlike anything really seen before. In the same way, the various inquisitions, crusades, and conversions of natives by force was unlike anything seen before. Sure there were probably more minor instances, but not on the scale that Islam and Roman Catholicism (and in some instances, Protestantism) did it. I think of it something similar like Hitler... Sure there were instances of mass genocide before him, but he totally changed things and really "raised the bar" so to speak. Same for September 11th, we've experienced terrorist attacks many times before in history, but not at that scale and not with that effect. Thanks. I was also thinking that colonization greatly contributed to the numbers. I am aware that the east had 4 Patriarchs and the west only had 1, I was just wondering about bishops of any rank. Today I believe the Catholic Church has more total bishops than all the patriarchates of the Orthodox Church combined but I wasn't sure if that was true back then. Right, I was originally wondering about the Orthodox Church that did not include the Oriental churches or any that were in schism due to not accepting an ecumenical council. That map actually makes it look like Rome had more than the other Patriarchates but it doesn't show Alexandria or Jerusalem. I wonder if I posted this question on a Catholic forum if they would come to similar conclusions. and the OC did not forcibly convert others? Is that a joke?! Who was that Byzantine emperor who cut the eyes out of 10,000 bulgarians again? I'm happy Charlemagne took a hold no prisoners stance with the saxons who were no saints in the slightest according to the vast majority of historians by the way. No, but they should be counted separately from the Eastern Orthodox faithful. I am not trying to dismiss them, but rather give them the proper recognition. I don't believe anyone is trying to say that the East does not have blood on their hands, but rather emphasizing that the West did use the sword to "motivate" people to convert prior to the schism. I think you are reading a bit too much into things we never said... We never said the OC never did so... Seems like you need to read what we say without putting words in our mouths. Who was that Byzantine emperor who cut the eyes out of 10,000 bulgarians again? That was Basil II, and it had nothing to do with religion- the Bulgars were already converted. to the RCC or Orthodox? I remember Roman Catholics saying there was much sheep stealing in Bulgaria. I'm asking if before the Byzantines invaded they chose to join the RCC. I clearly remember that one of the reasons for the schism was jurisdiction over Bulgaria. That's all. Byzantium and the west (chiefly the Germans) were both launching great missionary ventures among the Slavs.' The two lines of missionary advance, from the east and from the west, soon converged; and when Greek and German missionaries found themselves at work in the same land, it was difficult to avoid a conflict, since the two missions were run on widely different principles. The clash naturally brought to the fore the question of the Filioque, used by the Germans in the Creed, but not used by the Greeks. The chief point of trouble was Bulgaria, a country which Rome and Constantinople alike were anxious to add to their sphere of jurisdiction. The Khan Boris was at first inclined to ask the German missionaries for baptism: threatened, however, with a Byzantine invasion, he changed his policy and around 865 accepted baptism from Greek clergy. But Boris wanted the Church in Bulgaria to be independent, and when Constantinople refused to grant autonomy, he turned to the west in hope of better terms. Given a free hand in Bulgaria, the Latin missionaries promptly launched a violent attack on the Greeks, singling out the points where Byzantine practice differed from their own: married clergy, rules of fasting, and above all the Filioque. At Rome itself the Filioque was still not in use, but Nicolas gave full support to the Germans when they insisted upon its insertion in Bulgaria. The Papacy, which in 808 had mediated between the Franks and the Greeks, was now neutral no longer. The schism while attributed to 1054 actually occurred over a couple centuries. So my statement still stands, the RCC didn't exist before the schism. Some might say that the RCC didn't exist before the filioque. It's strange. It separates RC and EOC before 11th century, it does not acknowledge the fact of Oriental Orthodox (or are they combined with the EO?) and Nestorians. I took it as a Latin/Western Rite/Rome Patriarch versus Eastern/other Patriarchates distinction. it does not acknowledge the fact of Oriental Orthodox (or are they combined with the EO?) and Nestorians. They are the other, which doesn't pick up steam until the Protestants stabliize themselves against the Vatican. This is probably the best answer. The largest number of Catholics in the world are in Central and South America (Brazil having the largest having over 136 million) and they are Roman Catholic because of the Spanish and Portuguese. About 32% of all Catholics live in Central and South America. If it was not for the Spanish and Portuguese, there would not be as many Catholics in the world and their influence was not only in America but also the Philippines and other countries that were once Spanish or Portuguese colonies. They played an integral part in the spread of the Roman Catholic faith. To say that there weren't enormous differences centuries before the schism would be inaccurate. There were plenty of "turf wars" in Eastern Europe between Constantinople and Roman the centuries prior to the schism. Bulgaria was a battlefront. Also, when St. Vladimir was considering the new religion for his people, he listened to representatives from the East and West, even though they were still one Church. The theological and ecclesiastical differences were already very apparent, and he saw himself as looking at two different religions. I agree. One can see the samething when it comes to Anglicanism. I think before the schism, one should look at it as a fight between different rites. After the schism.....one should look at it as the way we do now. Turf wars over what rite to use also happens among us right now. The Antiochians had their own rite before they were Byzantinized.....and even before then, the early Byzantines were influenced by Antiochians. And so, friction between different rites is nothing new. If you were to start a mission today.....then you would have to use the rite of your jurisdiction. Alot of friction and discipline could happen if you tried to mix stuff from different rites. The Iberian Peninsula (Spain and Portugal, or Hispania) made the Roman catholic church the biggest church in the world, in the Americas, and the Philippines etc,. and in Greece The Spanish Emperor Theodosius made Christianity (pre schism Catholicism) the state religion of all the empire, (in Greece), so Spaniards converted everyone to one of the 2 versions of Catholicism, makes me proud to have roots in Saint Isidores' and Theodosius' city, Seville,Spain. Theodosius was Galician, so you could also say that the Celts everyone to Catholicism. haha well I'm Galician too, but Theodosius was born in Seville (vocata Hispalis) Andalusia Spain, which makes him an Andalusian Spaniard. Well, St. Theodosios may have made things "official," but Greece had converted well before his foray into politics.